What are passive harmonic filters? Home » What Are Passive Harmonic Filters? Passive harmonic filters are series filters (which means that current goes through the filter) that are used to reduce, or mitigate, harmonics to tolerable levels as defined by IEEE-519. Passive filters have many advantages over the active harmonic filters that are available in the market today. 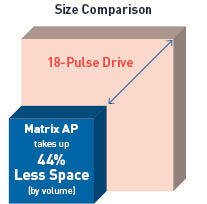 For example, MTE Corporation’s Matrix AP harmonic filter provides better performance feeding a 6-pulse drive than using 12-pulse or 18-pulse drives alone. On top of providing better performance, the Matrix AP is available at a much lower cost, and will take up a substantially smaller amount of space. Along with a lower physical and financial footprint, passive harmonic filters have guaranteed stability and have little to no power consumption.